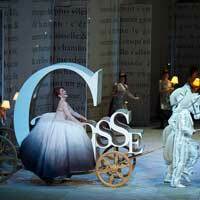 Jules Massenet adapted Cinderella with an irresistible blend of wit, sensitivity and elegance. The love duets in his Cendrillon are the very essence of romance, but there's hilarity, too, thanks to the most outrageous of all stepmothers. And if you want to hear glittering top notes sail into the stratosphere, there's the vocally high-flying fairy godmother. At the heart of Cendrillon is the delightful heroine -- and when she sings to her beloved, "You are my Prince Charming," it's truly magical! "...Stagg won hearts early with Cinderella�s self-comforting soliloquy, �Reste au foyer, petit grillon,� (Rest here by the fire, little cricket) � all grace and humility, laying no blame on her widowed father, who, it is fair to say, remarried badly. Pandolfe is his name; the soaring bass-baritone Derek Welton played him with more bravado and less self-deprecating befuddlement than one might have wished in the first scenes. But his consolation scene with Cinderella, when all seemed headed for the worst possible end for them both, was stunning in its deep expression of father-daughter love." "...This archly sophisticated production, conceived and directed by Laurent Pelly, is brilliantly designed and choreographed, and as much a visual as an aural delight. In tribute to its fairytale origins, everything transpires between the pages of a storybook. Pelly designed the costumes himself, including hilariously bulbous and geometric creations for two parades of potential brides. They're hugely entertaining the first time around; less so when they reappear in the final act. It's a minor qualm, but those princesses could use another set of amazing frocks." "...Unlike the more adult operas that precede and follow it this season, Cendrillon is wonderfully family-friendly fare, appealing to young and old alike. Lyric�s production doesn�t take itself too seriously, but traffics in fantasy, fairy tale, and fun. Don�t miss this rare production." "...Director/costume designer Laurent Pelly and set designer Barbara de Limburg have a different concept than Massenet�s A Midsummer Night�s Dream-inspired setting; this one is urban, comparatively simpler, and framed by Charles Perrault�s famous book of fairytales. It invites us into the mercurial images we form as we layer imagined images on top of texts. And conducted by Sir Andrew Davis, Massenet�s late Romantic music is nothing short of spellbinding." "...Based on the 1689 fairy tale by Charles Perrault, this very French rendering of the Cinderella story, with a zesty libretto by Henri Cain, has been �modernized� with ingenious, high-styled direction by Laurent Pelly in a production that was first performed at the Santa Fe Opera in 2006 and has subsequently been staged throughout Europe. At once zany and enchanting in its alternately playful and heartfelt storytelling, it is brought to life with stunning, highly original sets by Barbara de Limburg, and couturier-quality costumes by Pelly that are, in their way, full-blown characters in themselves." "...In short, while Cinderella may be a story ubiquitous enough to be a cliche, there's enough artistry, humor, and pathos in this version that makes the Lyric trip well worth it. Not to mention that the familiarity of the story makes it an excellent choice for opera-loving parents to pass on their love to the next generation." "...Adults and youngsters alike should easily laugh, applaud and fall in love with �Cendrillon,� Jules Massenet�s operatic interpretation of �Cinderella.�"
"...With libretto by Henri Cain, based on the Charles Perrault 1698 fairytale of the same name, Cendrillon follows Lucette, or Cendrillon (Siobhan Stagg, with stunning vibrato), who decides to escape her miserable home life for one night to go to the ball. Unlike the popular Disney version, Lucette's father, Pandolfe (Derek Welton) is alive, and stuck in a dead-end marriage with Mme. De la Haltiere (Elizabeth Bishop), who runs the household with her daughters Noemie and Dorothee (Emily Pogorelc and Kayleigh Decker). Because Pandolfe finds himself powerless in his marriage, Lucette is still stuck in a life as the family servant, whose only joy stems from sitting next to the fireplace."